I found a jpeg of what looks like an old Light Steam Power drawing/plan of a Stanley Feed Water Automatic. Ron posted it here under the "Resonant Circuit" thread, and I also found a version of it at steamcar.net, but both scans are fuzzy/grainy, with some of the dimensions almost impossible to read. It looks like the brass expansion tube is marked 1/2" OD x 16 gauge wall x 15.25" long. Since the drawing is British[? ], and the tube is nonferrous, I don't know which gauge system it refers to. My reference books give at least 8 different "metal gauge" systems. I figure that the tube wall thickness is equivalent to Schedule 40. 1/2" OD would mean 1/4 inch "nominal pipe size"; well, actually that is 0.540" OD. It also looks like the copper feed-water delivery tube to boiler is 5/16" OD, and the valve ball is 5/16" too. Is this correct for a 20hp Stanley boiler? Those dimensions seem awfully small, lots of flow restriction through both valve and delivery tube. I am tempted to think that these parts are sized for smaller boilers. The drawing does not specify what size boiler it is for. 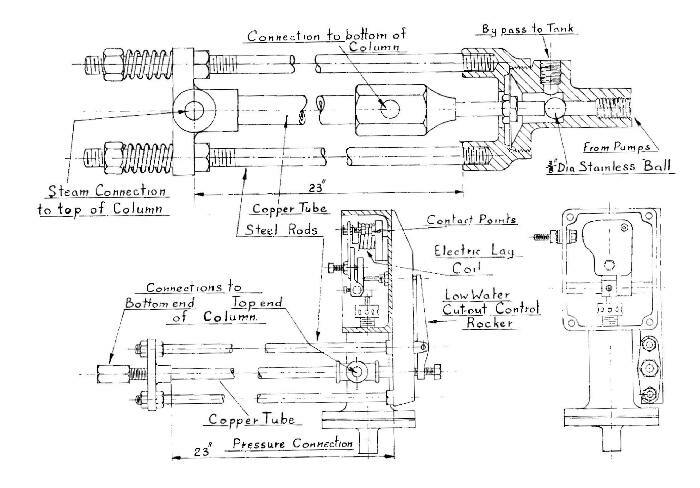 Also, the drawing says nothing about the size of the steel rods flanking the expansion tube -- I call those "frame rods" or "reference rods", but I don't know the proper name. My "eyeball measurement memory" of the Feed Water Automatics which I have seen, is that the expansion tube is about 1/2" OD, and the rods are about 3/8" diameter. Another issue with this drawing is that the valve is specified to be Monel alloy, with a guide, which doesn't sound like something FE & FO would put in their cars. That makes me wonder how original the other specifications/dimensions in this drawing are. Many years ago, I tracked down all these details and blueprinted a version of the Feed Water Automatic which I could easily build, mostly out of off the shelf high-pressure forged pipe fittings, but now I cannot find those blueprints anywhere. And I cannot remember any of the details. As Charlie Brown says, "rats". I have to do it all over again, from scratch. 15.25" long red brass expansion tube, 1/4" nominal Schedule 40, 1/2" valve ball on 0.348" port [size "S" drill], gives same flow restriction through bypass valve as through Stanley feed water pump check valves. Tube wall psi loading in 1/4" nominal brass pipe [0.540" OD x 0.0.364" ID; 0.088" wall thickness] at 500psig boiler pressure is extremely low; no need for Schedule 80 tube. 3/8" diameter steel frame rods. I think these numbers work. I bet these are about exactly the specs of 20hp Stanley Feed Water Automatics. Edited 2 time(s). Last edit at 02/12/2019 06:33AM by Peter Brow. One thing you may want to ask the Stanley guys that know is how fast does that automatic react? It may not be quick enough for a boiler with very small volume. I have one of those on loan from a buddy to copy, but I haven't tried it on my Ofeldt because of that concern. A friend of mine has a stanley water automatic on his 40' steam boat. The boiler holds about 40 gallons of water and is a water tube type. The automatic doesn't quite handle enough volume of water to keep up with the feed and we have to use the manual bypass to make up the difference in volume due to the size of the lines to and from the automatic. I'm sure on a smaller volume (like the 15 gallons in the stanley boiler) it works fantastically well and with the smaller volume of feed water from the small stanley pumps. That is another consideration, the boat probably runs at under 200 psi boiler pressure, so feedpump pressure is only a few hundred over that. In the case of the Stanley running at perhaps 500 psi, the feedpump pressure is probably pulsating to a thousand psi, higher pressure through the same size opening will equal higher transferred volume. So it's probably safe to say in a lower pressure system under 200 psi, the ball needs to lift further off the seat. More extension and contraction of the sensing tube. How to get that? Longer tube or larger seat and ball. Totally unrelated subject, but the same issue is found in steam whistle design. Higher pressure whistles have a thinner slot in the languid plate. You must be talking about "Persistence"? Formerly known as "next weekend"
The Stanley water automatic is a heat regulated by pass valve. The water pump has to keep up with the demand. There are several sizes, the overall length of the expansion tube determines the ball travel and the volume the valve will open and pass. Most are mounted at a slight angle no more than the diameter of the tube so as to be empty at the low water of the inside diameter of the tube. The pipe feeding the back end of the tube connecting to the bottom of the boiler, on a Stanley is taken from the bottom opposite side and should be at least four times the length of the expansion tube or longer. Normally run below the condenser to get cool air so as to have cooler water when entering the expansion tube as the boiler fills shrinking the length and opening the bypass valve maintaining a differential of water level of two to three inches in the boiler. Thanks for that info. This summer I may try one of those. Ofeldt had one as well, with shorter tube and a clever design with an arm that amplified the extension and contraction of the sensing tube. Yes, that would be "Persistence" AKA "Next Weekend". I am one of the engineers that get to play with all the equipment and make her go. She's a true steamer with no wheel house controls, just a telegraph to ring the engineer commands. Lots of fun. I say it's my time machine, lets me experience life aboard ship in 1910 (when the engine was built). Everything is steam powered except for the radio, depth sounder and some LED lighting. Many years ago, David Nergaard said that the Stanley feed water automatic was pretty fast-reacting, like full open/shut in a couple seconds. 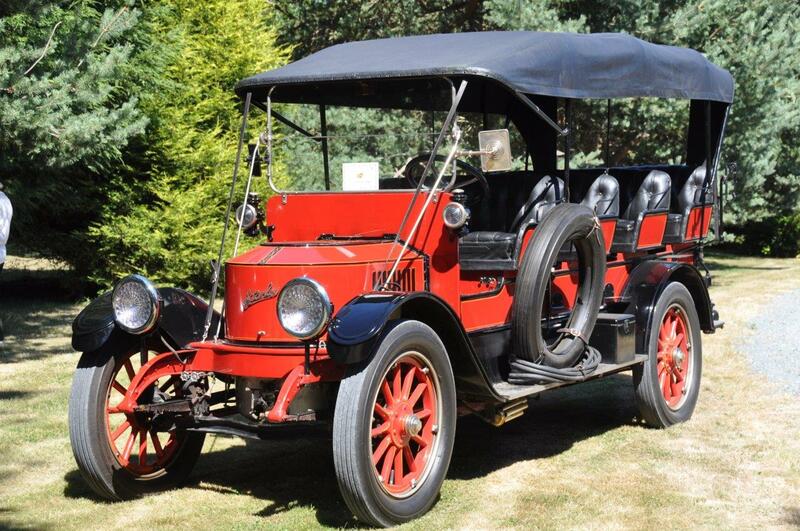 I have read about and seen photos of many steam cars with ofeldt, bolsover, and other light water tube boilers, equipped with Stanley or ofeldt style expansion tube feed water controllers. Thanks for the information on how the bottom tube of the feed water automatic is set up in Stanleys. I had always wondered, and just went ahead and added a vertical corkscrew coil to the bottom of the boiler, to speed it up. Nice to have a "rule of thumb" to follow. What size valve ball was used in the 20 hp Stanley feed water automatic? I don’t remember Peter. I may have it at home. The other thing to remember is the Stanley has two water pumps and with normal use on flat roads only one pump generally is required. The bypass is opened on the second pump back to the water tank. On hilly roads the valve can be closed and a much faster fill rate can be had. No problems; I was thinking maybe somebody was working on one recently, and might happen to have the numbers fresh in mind,to give me an "R&D starting point". . After recent blueprinting work and research, I think the ball/port/expansion-tube sizes are decently easy to change, test & tune. My target vehicle, and modern driving conditions, are different from what Stanley originally designed for anyway. It just needs road-testing and tuning, just like FE & FO & their successors -- and every other steam experimenter, ever -- did over the years. For a starting point, I have found numerous drawings and photos of Stanley Feed Water Automatics where the ball diameter looks nearly identical to the expansion-tube diameter, which I have seen enough of, first-hand, to "eyeball-estimate" at approx. 1/2 inch for a "20HP"/4gph fuel/350 lbs/hr [continuous rate; temporary/overload/'reserve" rate 2-4x+ higher] steam generator/boiler. Maybe 7/16", or 9/16", or 5/8" ball, or some other size, are better for my vehicle -- a few builds/tests on the road will tell. A bit of simple machining/assembly and road testing, not a problem. Actually the builds/tests are all part of the fun. If the numbers turn up, then thanks, but I'm not "lost without them". I have several layers of "independent backup and build/test/figure-out" going on here too. The Stanley controls are far simpler and easier to design/build/replicate than the other things which I have been inventing/designing/blueprinting lately. They also used a similar expansion bypass system for low water fuel shutoff. I do not remember seeing any in use but there in the parts catalog. They look pretty much the same. The Stanley Low Water Automatic Shut-Off looks very similar to the Feed Water Automatic; brass expansion tube flanked by steel rods. An interesting difference is that the fuel valve stem, if we can call it that, passes through a sealed flexible diaphragm instead of a stuffing box. That eliminates a potential leak point for high-pressure fuel; good design feature. I am going to check that drawing list at steamcar.net and see if they have a dimensioned drawing of the Low Water Automatic. The expansion-tube Low Water Automatic is definitely what I plan to use in my project, not a fusible plug. What would be really great would be a low-water device which also prevents firing up a dry boiler from cold, but I've never been able to figure out a good way to do it. Perhaps something with a float in a chamber, similar to the Stanley "kidney bottle" boiler water level gauge...? I did come up with an automatic-start system that would prevent "dry fireup", but it is not technically a low-water fuel-shutoff. Hmm,theoretically the stuffing box on the valve stem in the Feed Water Automatic [Bypass] could also be replaced with a diaphragm seal. Since it is on the output side of the bypass valve, with relatively low pressure, it might not be too difficult to design or build. It is located close to the expansion tube, so it might get hot enough that a metal diaphragm would be necessary. I suspect that the stuffing box is probably better overall, though. I have been a bit busy working on a 1909 Stanley lately, so I haven't had much time to respond to this thread. The water automatic and the low water safety both use 5/16" diameter support rods. The length of the water automatic water tube is 16" long, where as the low water safety's tube is only 9 " long. The check ball for the water automatic is 3/8" diameter. The water automatic's bottom tube going to the bottom of the boiler I insulate so as to keep me from getting burned on it. I want the lower tube's temperature to be the exact temperature as the water in the bottom of the boiler. The bottom line on my 1909 is only 9 " long. The water automatic is very responsive to the water level. One can hear the pump's ball checks pumping freely through the bypass as compared to when they are laboring against the boiler pressure. Here is an illustration of the Stanley Low Water Automatic, with some details, but alas no info on the diaphragm seal. It is the drawing at the top of the sheet. The illustration at the bottom of the sheet shows a different device which seems to use an expansion tube to turn on/off an electrical switch depending on boiler water level. I think it also has a control input from a pressure-sensing diaphragm? I'm not sure exactly what this device does. Maybe it deserves its own thread. It is in the same jpg file as the Low Water Automatic drawing. Edited 3 time(s). Last edit at 02/16/2019 05:04PM by Peter Brow. Thanks Pat! Are those numbers for a 20hp Stanley? Wow, 9" thermal-expansion tube on the Low Water Automatic -- the drawing I found/posted shows something like 20"! I trust your numbers, not the old drawing. The 20-inch tube would work, but it doesn't need to be that long. The 9" tube is for the Low Water Safety. The 16" tube is for the Water automatic. Its too easy to get these two names mixed up as you have shown us. The 16" tube is the actual length of the brass tube for the Water Automatic. With the rest of its fittings, 20" could be measured overall. The Water Automatic was never factory installed in the 10 HP Stanleys. They could be dealer installed into the 10 HP Stanleys though. The water automatic was designed to be used for the 20 hp and the 30 hp Stanley steamers. Our 30 HP 1916 Stanley Mt. Wagon weights 7.500 pounds when fully loaded with 12 people. Its water automatic has never given us any trouble in the 20 year that we have owned the Mt. Wagon. It's water sensitivity responds quickly. The Mt Wagon uses 2 gallons of water per mile and its water system has never disappointed us. Edited 1 time(s). Last edit at 02/16/2019 10:42PM by SSsssteamer. Thank you for the information on the Feed Water Automatic Bypass & Low Water Automatic Fuel Shutoff; much appreciated. I hope to put this information to good use. I thought that the Feed Water Automatic Bypass _might_ have been standard equipment in later 10HP Stanleys; scratch that idea; later retrofit only. I have never seen reports of Feed Water Automatics giving trouble on the road, even when fitted to lighter/smaller-reserve boilers like Ofeldts, Bolsovers, etc..
Edited 2 time(s). Last edit at 02/16/2019 11:16PM by Peter Brow. Micro-progress report/Post-Script: Last night I completed the shop drawings for the Feed Water Automatic By-Pass [boiler water level regulator], Low Water Automatic Safety Fuel Shut-Off [shuts off burner FAST if water level in boiler gets too low -- preventing dry/scorched boiler], and Steam Automatic [burner controller/boiler steam pressure regulator]. Parts count is 33, 29, and 28, respectively; 90 total. That's a lot of parts to design and draw up in 5 days; lots of "midnight oil burning". Whew. Technically the Steam Automatic drawings are "semi-redrawn", with a number of design changes for improved durability and fabrication ease. Most parts are off the shelf; some parts, like hex nuts, rods, packing rings, etc, several are used; all machining minimized and simplified for "easy DIY fabrication in the small/modestly-equipped home shop". No custom castings, welding, or forgings are used. Drawings contain all dimensions, specs, and parts numbers for ordering, and are organized into folders, drawing sheets are numbered, with assembly/part-number diagrams and indexes for easy look-up of individual components. All critical dimensions are identical to the Stanley "Automatics", to maximize odds of success, however the modular construction allows for [relatively] easy changes in the shop and/or after road tests. Only thing left to do on these items now is build and test them and see if they do the job. Fingers crossed. Thanks again to everyone who supplied critical specs and dimensions, both recently and over the years; your information is going to good use. Edited 1 time(s). Last edit at 02/23/2019 03:57AM by Peter Brow.